During our time in Dubrovnik, we took a side-trip to Montenegro, which is just over the Croatian border (for you James Bond fans, this is where Casino Royale took place). I wore this adorable (if I do say so myself!) 1950s umbrella print dress, which ended up being perfect for the occasion. It was acquired in August and worn only once before, to our housewarming party. Unfortunately, I wasn’t able to get photos of it then, as I was frantically running around making appetizers and sewing pillows! 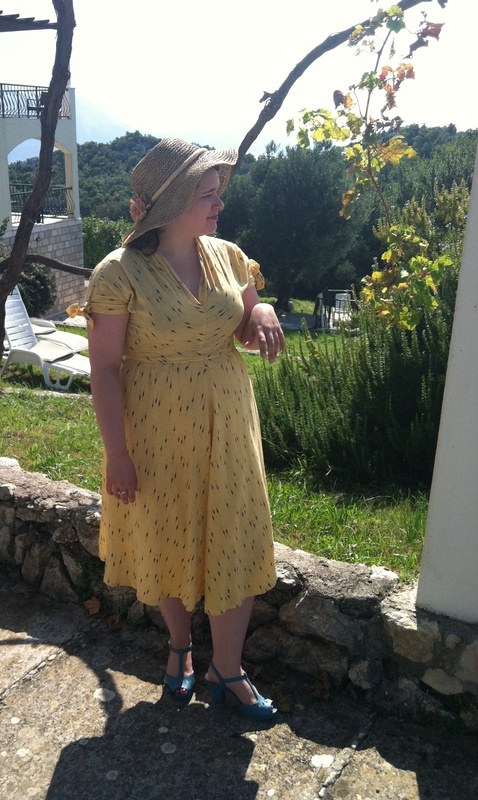 I believe the fabric is a linen rayon blend; regardless, it’s incredibly breezy and lovely to wear. The bodice is cut on the bias, which allows for greater movement, and the sleeves have a really great tie detail (unfortunately, every time I wear this dress I need help with the sleeve ties!). 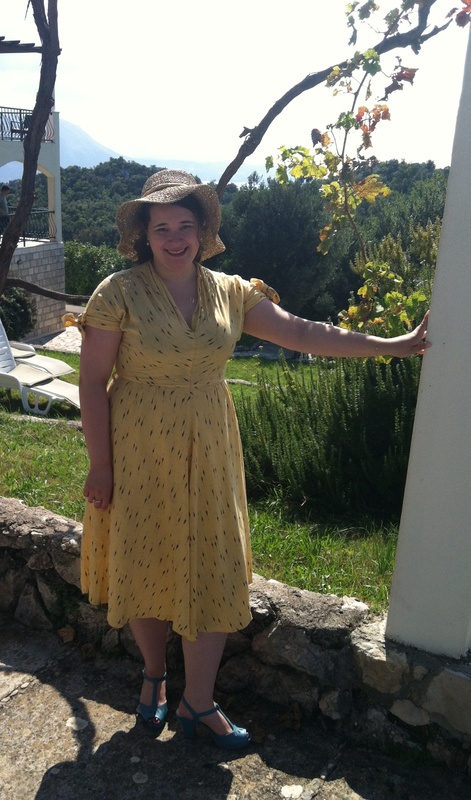 I paired it with a floppy straw hat, which was a lucky find in Dubrovnik’s Old Town the day before (silly me forgot to pack her hat). 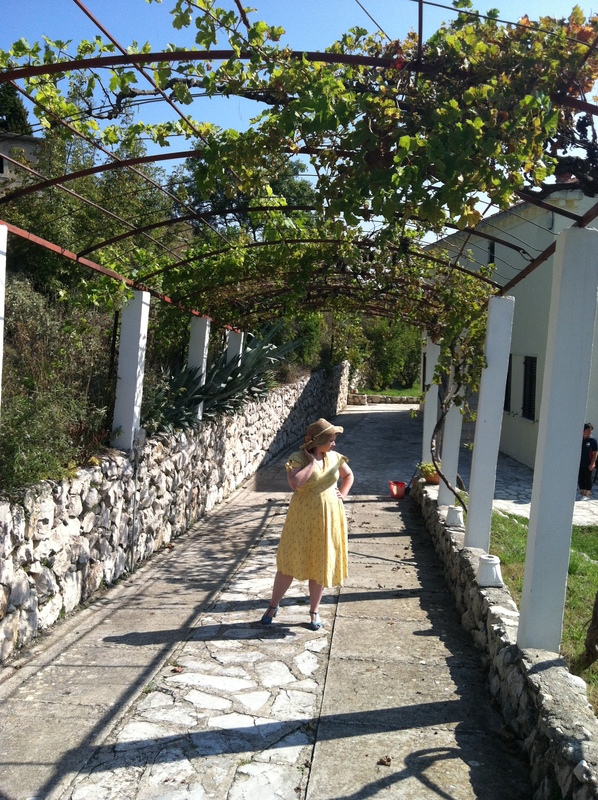 The dress photos were snapped at the villa we were staying in shortly before we left for Montenegro. 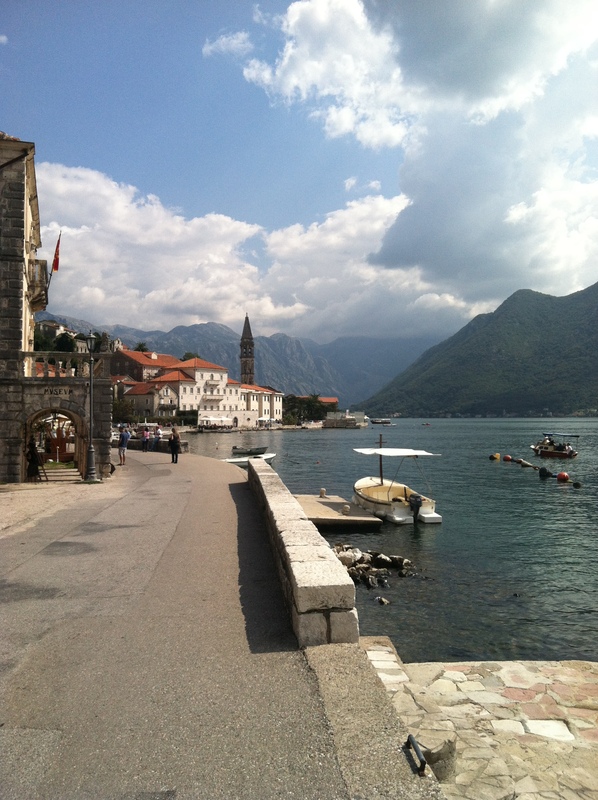 Unfortunately, I don’t have any pictures of me in it there, but I did get some scenery photos of Montenegro, and it’s just GORGEOUS. Before we left, we ate lunch at a restaurant right next to the sea, and met this adorable one-eyed restaurant kitty. Peter tried to sneak her some food, but I don’t know if the one-eyed thing meant she couldn’t see it. At least living at a seafood restaurant means she’s well-fed! Speaking of kitties, it seems Pugsley has come down with a bit of a kitty cold as well as having Giardia, a water parasite. It’s been poop-a-palooza here, and we’re really hoping the medicine that he’s on starts to take effect soon, although, luckily, he does seem to be getting over the cold. In the meantime, we’ve learned a ton about kitty care and gone through a ridiculous amount of paper towels! Anyways, I’m planning on doing a ton of autumn crafting this weekend, and also have a design consult meeting for a potential (very exciting!) commission! Hope everyone else is having a great weekend! Ooh so pretty! Both the dress and Montenegro 🙂 but 😦 to kitty problems. Oh, thank you! He’s not feeling a whole lot better, so I think to the vet he’ll go! Thanks so much! Gastro is definitely no fun for anyone, he’s miserable and I’ve just been cleaning so, so much! As for the shoes, they were a great find at Bettie Page (now Tatyana). What a splendidly gorgeous backdrop and fabulous yellow dress. Yellow, especially in large doses, is one of those colours that far too many shy away from these days. It’s a real shame, because as you demonstrate here, it can look as lovely as a field of buttercups on a sun-kissed day. Aww, thank you so much, Jessica! I love the “field of buttercups on a sun-kissed day description” and I totally agree that you don’t see enough yellow! Luckily for me, it works with my brunette hair, and I’m trying to incorporate more yellow into my wardrobe. Umbrella print!? How perfect! And Montenegro? Oh man…I want to go so badly! It’s wonderful you snapped a few pics! I hope by the time my comment reaches you that Pugsley is feeling better! Thanks! 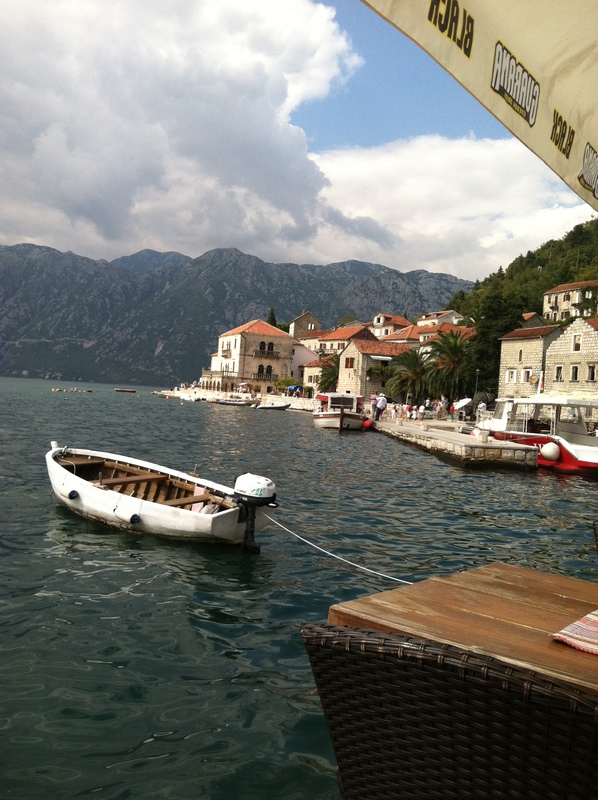 Montenegro was fabulous, I would love to go back. And thanks so much for the Pugsley well-wishes! He’s over the kitty cold, but still having the tummy issues, so I think a call to the vet (yet again. Le sigh) is in order.